Our drill bit guide is a handy tool that’s portable to fit into awkward angles and allows you to drill straight. Drilling straight at times can be challenging or “eyeballing” it just might not work in your project. 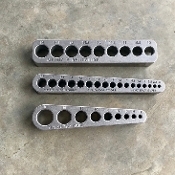 The drill guides by Big Gator Tools, called V-DrillGuides come in various sizes. 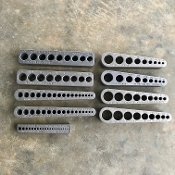 All of the drill guides have a Lifetime Warranty and are 100% USA made. Each drill guide comes with a FREE plastic storage case. 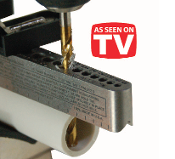 We have been featured on As Seen on TV, and have won multiple innovation awards for our 90° “V-groove” design that runs through the entire guide. 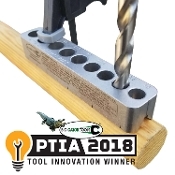 This “V-groove” is found on the bottom of the drill guide and ensures perpendicular alignment on round and cornered material. Ground base feature allows use on flat surfaces. 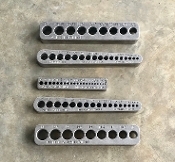 The hole sizes and hole alignment marks are permanently embedded onto the guide to allow quick and explanatory drilling sizes. Time and money will be saved by drilling a hole only once with perfectly aligned holes on wood, plastic or metal surfaces. 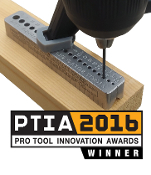 Easy to use: hold the drill guide on the material with the “V-groove” side resting on the drillable surface, clamp and drill. Please let us know if you have any questions about our V-DrillGuides! Drill Straight - Every Time!